I'm normally loathe to link to Etsy, but once in a while you find a real gem amidst the felted vaginas and cosplay cat ears. 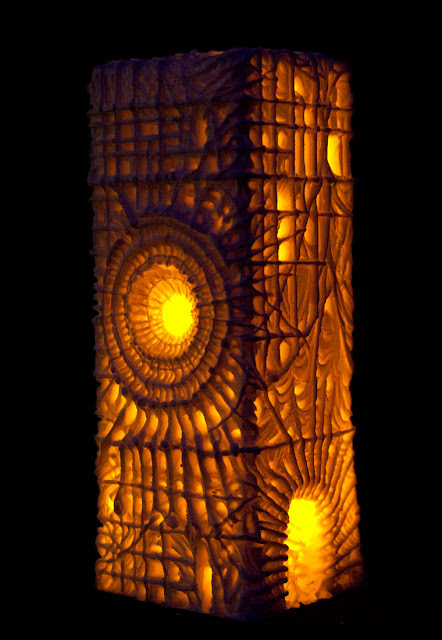 Artist Jason Hite brings us this candle holder cast in translucent resin. There's something about the mix of geometric and organic forms that just screams "alien artifact" to me. I will note that he says "not for real candles, only LEDs." I was just about to write that it looks suspiciously similar to this: http://1.bp.blogspot.com/_yfRYdTRW2AQ/TLIx-4X8fHI/AAAAAAAABiE/VluI3rbWrPI/s1600/1983+002534.jpg painting by Zdzisław Beksiński, but then I've read on etsy that the artist himself says it was inspired by Beksiński's works. Worth checking them out if you don't know them. Stunningly nightmarish stuff.